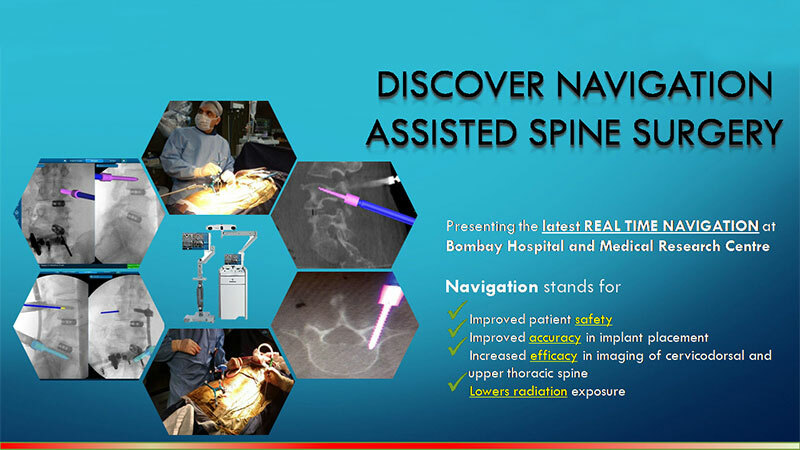 Best Spine Surgery hospital, Spine Surgeon in Mumbai, India. 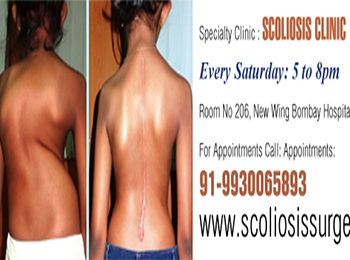 Dr. Arvind G Kulkarni heads the ‘Mumbai Spine Scoliosis and Disc Replacement Centre’ as a Consultant Spinal Surgeon at Bombay Hospital, Mumbai, one of the oldest and largest hospitals of India. 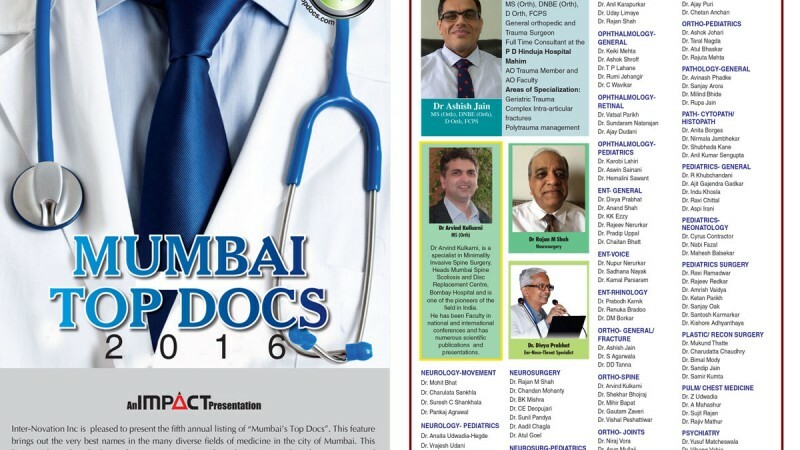 He has a vast experience in spinal surgery having trained in some of the top spinal centres across the globe such as KEM Hospital Mumbai, National University Hospital Singapore, Westmead Adult & Children’s Hospitals, Australia, St George Hospital – Australia and Toronto Western Hospital & Hospital for Sick Children Canada. 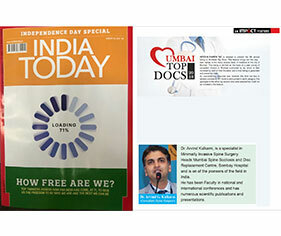 Featured as one of the ‘Top Spine Surgeons’ of Mumbai in surveys conducted by the popular ‘India Today Magazine’ in 2012, 2013, 2016 and 2018 (No survey was conducted in 2014 and 2015). Faculty at ‘Minimal Access Spine Surgery Workshop’, Bangkok – 15th & 16th June 2013. 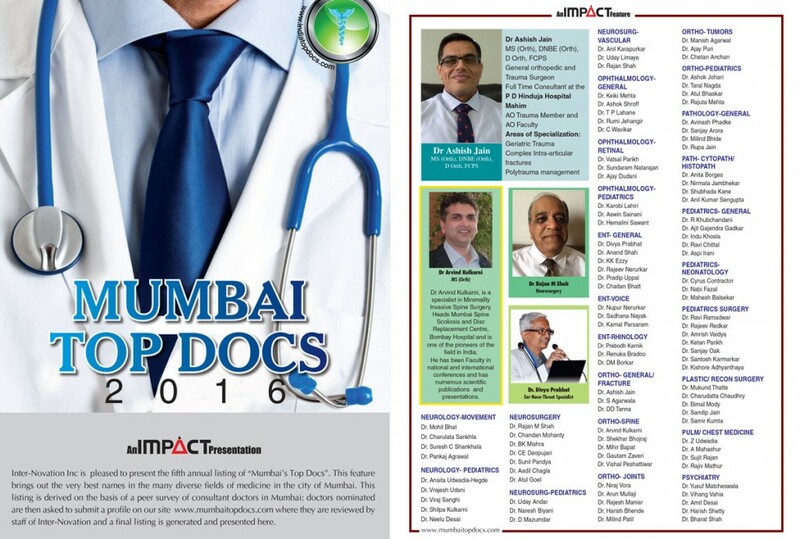 Faculty at ‘Minimal Access Spine Surgery Symposium’, Fortis hospital, Mulund on 9th June 2013. 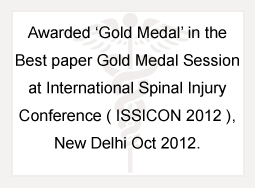 Faculty: NZOA(North Zone Orthopaedic Acssociation) Conference – 1st May, 2013 – Srinagar. Faculty: Cadaveric Course on MAST & BKP, Ahmedabad, 21st April 2013. Faculty: AO-ORP Training – 21st February 2013, Ahmedabad. Faculty: AO Principles Course, 22nd to 24th February 2013, Ahmedabad. Kulkarni AG, Dhruv AN, Bassi AJ. Posterior Cervicothoracic Instrumentation: Testing the Clinical Efficacy of Tapered Rods (Dual Diameter Rods). J Spinal Disord Tech. 2014 Nov 4. 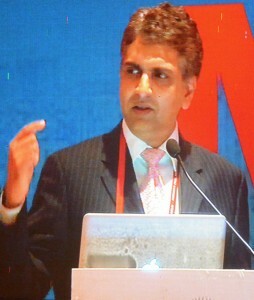 Kulkarni AG, Dhruv A, Bassi A. Microendoscopic lumbar discectomy: Technique and results of 188 cases. Indian J Orthop. 2014 Jan;48(1):81-7. Kulkarni AG, Dhruv A, Bassi A: Should We Cross the Cross – Links? – Spine (Phila Pa 1976). 2013 Aug 15;38(18):E1128-34. Kulkarni AG, Dhruv A, Bassi A: Micro-endoscopic excision of C2 – Osteoid Osteoma – Spine (Phila Pa 1976). 2013 May 23. [Epub ahead of print]. Kulkarni AG, Shah SM. CT Based Evaluation of Odontoid Morphology in Indian Population: Indian J Orthop 2013;47:250-4. Kulkarni AG, Deopujari CE, Shah SP. 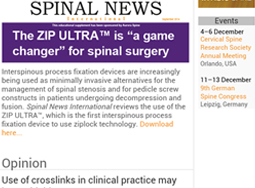 Intradural cement leakage with paraparesis and incontinence: a rare but salvageable complication of percutaneous vertebroplasty (Journal of Orthopaedic Surgery, Hong Kong) – 2013 Dec;21(3):365-8. Calcaneal Reconstruction in Intraarticular Joint Depression Type of Fractures [Paper presented at the Bombay Orthopaedic Society Meeting held at Dr. R.N.Cooper Hospital, Mumbai on 29th July 2001] (First author). The Value of Orthogonal Plain Radiographs in Determining the Position of Thoracic Pedicle Screws [Paper presented in APOA (Asia-Pacific Orthopaedic Association) Conference, September 2004 at Kuala Lumpur, Malaysia] (First author). The Value of Orthogonal Plain Radiographs in Determining the Position of Thoracic Pedicle Screws [ORAL & POSTER PRESENTATION: Spine Society of Australia, Annual Conference, April 2005 at Auckland, New Zealand] (First author). Segmental fixation of C1-C2 for atlantoaxial instability [ORAL & POSTER PRESENTATION: Spine Society of Australia, Annual Conference, April 2005 at Auckland, New Zealand] (First author). Thoracic disc disease – Case presentation: Presented at 6th Annual Stryker Spine Symposium, 29th May, 2005 at Ayer’s Rock, Northern Territory, Australia (First author). 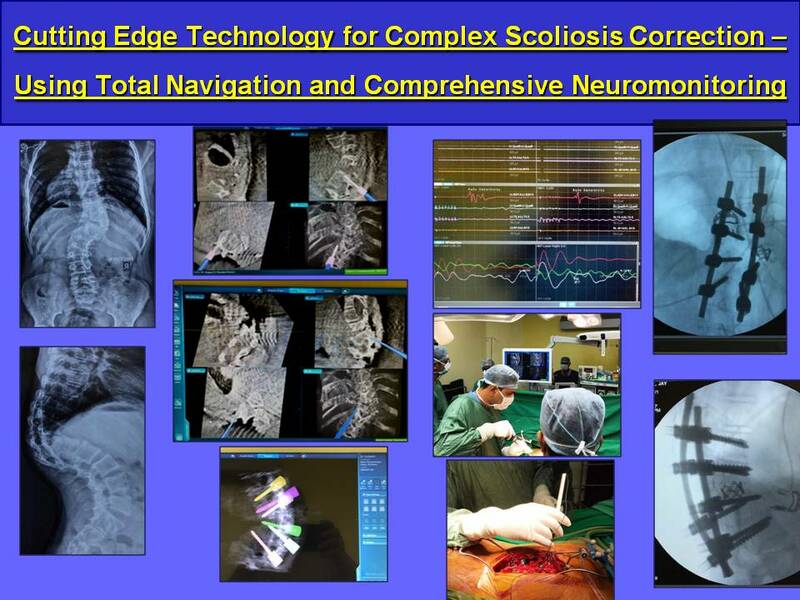 Preliminary radiological results of Solis (PEEK) cage for anterior cervical fusion [POSTER PRESENTATION: World Spine Society, III Annual Conference, July 2005 at Rio Di Janerio] (First author). 'Micro-endoscopic spinal surgery' is a specialized revolutionary technique in which the routine spinal surgeries are performed using a key-hole.